Thomas a Kempis, tabula picta eius temporis servata Svollae. 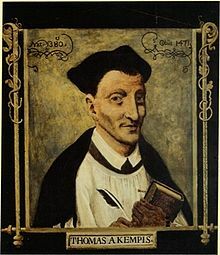 Thomas a Kempis (Campinnis natus circiter anno 1380, nomine Thomas Hemerken; obiit die 25 Iulii 1471 in monasterio apud Svollam in Nederlandia) fuit monachus et mysticus Nederlandicus. Liber De Imitatione Christi putatur eius magnum opus. Novissima mutatio die 28 Maii 2017 hora 17:44 facta.